Time is flying! When I looked at the calendar and the numbers 2 and 9 were processed in my head, I almost took my computer to the technical services or saw if it needed some serious/urgent updates. The main reason why I completely lost track of time has a name: “Comprehensive Exam”, and it is followed by the sound of drums inside my head when I say it out loud or write these two words that begin with C and E together. Calling it “Comp” makes it nicer, shorter, and cuter, so I will share some of my thoughts about my Comp (way better!). I have just submitted the report for my Committee, and I feel good and anxious at the same time. Since I started to write my Comp (!) some time ago (before Christmas), I had time to breathe and completely ignore the existence of that JVidalComprehensive.docx file for a couple of days, whenever I could not look at it anymore or my brain could not think of any relevant information to be added. These breaks helped me to have a new perspective of what should be written or corrected, and therefore I was really happy with the final version (and not completely tired of it) when I sent the file. I had time to observe during this year and a half in Canada that my English tends to fade away when I am anxious. Therefore, I have been trying to control the act of being nervous or worried so I could communicate better. I know that, during the Comp (!) is going to be hard to control all of these feelings, but I keep trying to remember how being nervous won’t help. “Worry is the way to concern” is a Christopher Robin quote that I like to think whenever I feel the Comp (!) butterflies in my stomach. We have two new people working in our group since the beginning of this year. Dr. Nigel Jalsa (as he says, salsa with J), a professor from The University of The West Indies in Trinidad and Tobago, and James Beaton, a PhD student from the University of Bath (UK) are doing some interesting research in the area of biodegradable polymers. 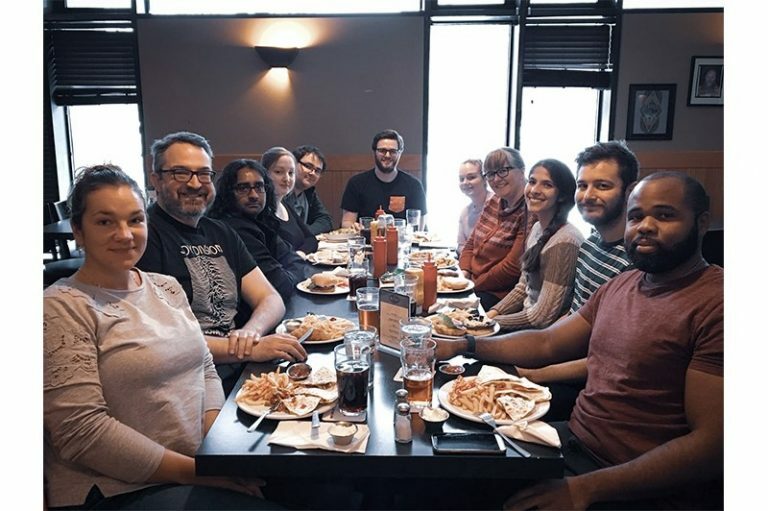 Different cultures, ideas, chemical reactions, ways of doing exactly the same thing… Time to learn, step out of the comfort zone, use different instruments in the lab, and eat a double double hamburger at Bitters to celebrate! In the photo below, you can find my face of pure joy in having a great time with my group and eating a hamburger full of cheese (and no vegetables) for lunch! In the middle of all of this, I try my best to chill with my two best friends (Cigano and Arthur) during the weekends. However, our Saturdays and Sundays became busier and funnier after we met Ciara, Matthew and Ziggy (a very rare gremlin-dog mix) last year. Cigano and Zig became friends instantaneously, just like Ciara and I, and we had no other option besides making sure we had weekly dog meetings. Our meetings are usually what we call a #success, since the dogs drain their energy and we spend 2 hours of our life just laughing at them, playing with them, and taking pictures of them! Sometimes they play with something they shouldn’t (such as my purple hat), but I guess that is normal when you have super energetic, and most important, super happy dogs. At the beginning of January, Ciara took us for our first winter walk in Pippy Park, and we had the time of our lives! The dogs loved it, and so did Arthur and I! 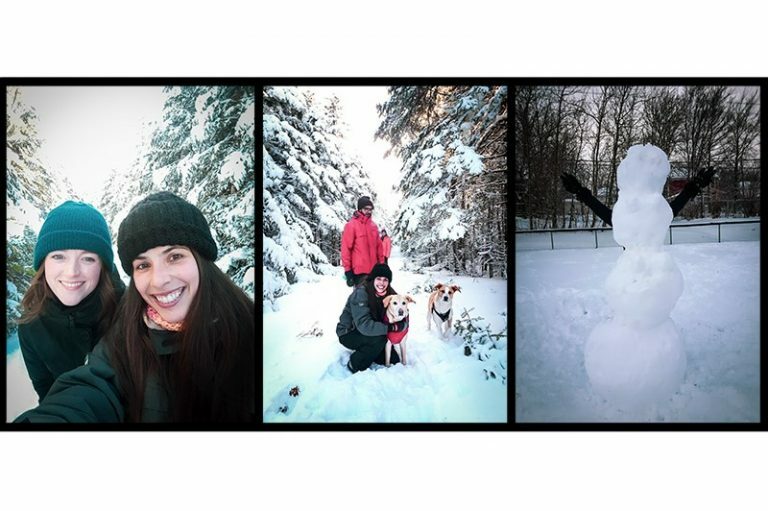 We also built my first giant snowman (Jeremy, The Second), who was later decapitated (just like Jeremy, The First), and had his arms pulled off by the dogs without any mercy. He had a great life, and fought like a warrior, though! Oh well, I think I took too much of your time already! In summary, things are busy but great, and I am always thankful. In my next blog post, my Comp (!) will be long gone, and I will try to pass along the feeling of what it is like to go through this hard, but fundamental experience of graduate studies here at MUN. Meanwhile, I will continue studying and doing my best so I can celebrate with my Canadian and Brazilian families on March 21st. Thank you guys so much for reading! Muito obrigada! 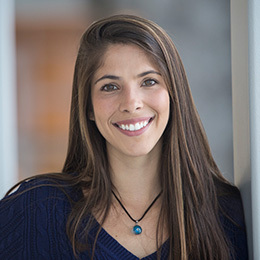 Juliana Vidal is from Juiz de Fora, Minas Gerais, Brazil and is completing a PhD Chemistry.